For information regarding tuition assistance, use the site menu or click one of the logos below. There are five ways to attend the Full-Time program at Dan Rinehart Taxidermy School. See the detailed descriptions below. Bird, mammal, deer head, fish- one week each. A total of four weeks comprised of 176 hours of instruction. The full course is the most comprehensive education in taxidermy. As a full-time student, you will learn and master all the techniques of a high-quality professional taxidermist. After graduation, you will have the knowledge and credentials needed to start your own professional taxidermy studio. Full-time students have the best success ratio, so enroll today and start your future as a professional taxidermist. Day 1 -Registration and welcome by school administrator. Review rules of conduct and equipment check. Pheasant skinning lecture and demonstration. Specimens issued and students start skinning. Day 2 -Student bird skinning, pheasant mounting lecture and demonstration. Day 3 -Review mounting procedure, student continues pheasant mounting with instructor evaluation. Day 4 -Waterfowl skinning lecture and demonstration, followed by students skinning their own waterfowl. Day 5- Students continue mounting waterfowl. Lecture and demonstration on finishing mounts and airbrushing. The secret of bird taxidermy is learning the proper techniques and procedures. Rinehart instructors have mounted thousands of birds and have developed techniques that are revolutionary to the taxidermy industry. Breakthrough procedures and techniques will make your bird taxidermy more accurate and efficient. Training includes all techniques from beginning to completion. 44 hours total. Specimen required: Gray fox. Day 1- Medium mammal registration. Lecture and demonstration on skinning and fleshing. Students start skinning specimen. Day 2 -Student skinning, lecture and demonstration on fleshing and tanning. Day 3-Lecture and demonstration on manikin preparation. Lecture and demonstration on habitat base creation. Lecture and demonstration on mounting the mammal. Day 4 -Students mount mammal. Day 5-Finishing work on mammal. Instructor/student mammal evaluation. Lecture. Mammal taxidermy is one of the most profitable and exciting areas in taxidermy. Whether a raccoon or a Grizzly Bear, Rinehart instruction provides you with the knowledge and "hands-on" training needed to perform the highest quality mammal taxidermy. Enroll today and learn the secrets known only by the BEST taxidermists. Day 1-Deer head registration followed by lecture and demonstration of skinning cape. Students begin skinning deer. Day 2-Lecture and demonstration of tanning, students start tanning process. Lecture and demonstration on detailed fleshing techniques. Day 3-Lecture and demonstration on mini-flesher, table flesher, different tanning methods and manikin preparation. Students then mini-flesh, tan and prep manikin. Day 4-Lecture and demonstration of mounting deer, students begin mounting their own deer shoulder mount. Day 5-Students continue working on their deer. Day 6-Finishing technique lecture. Instructor/student evaluation. Students own completed mounts. This is the BIG one! More whitetail taxidermy is performed in the United States than any other type of taxidermy. Rinehart instructors have numerous Blue Ribbons from International Taxidermy Competitions in the category of Whitetail Taxidermy. Each instructor is also know for their superior quality "professional" taxidermy. By attending this course, you will gain the professional techniques that have taken Rinehart instructors a lifetime to learn. Week four- Fish skinning, scraping, mounting, and airbrushing. Day 1 -Skin and scrape two fish – skinning, cleaning and preserving fish skins. Day 2-Mount two fish – pre-fitting manikins, mounting skins, positioning fins, filling cheeks, setting eyes. Day 3-Airbrushing principles and coloration – Airbrush set-up. Instructor lecture and demonstration on airbrush techniques and maintenance. Day 4-Fish finishing – Instructor lecture and demonstration on flexible fins, hanger/backboard, epoxy work and seam repair. Day 5-Fish airbrushing – Instructor lectures and demonstrates fish airbrushing. Students airbrush fish. Day 6-Finish airbrushing and clean-up. Enroll in this course and receive a COMPREHENSIVE education in the field of fish taxidermy. 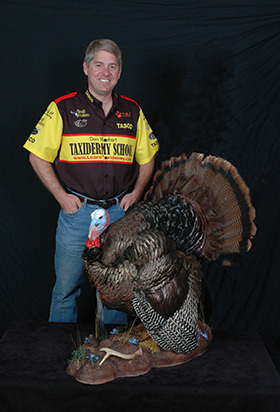 Again, Rinehart instructors have won numerous International Taxidermy Championships in the area of fish taxidermy. This is your chance to absolutely learn from the BEST! You will learn everything from beginning to end - skinning, preserving, body carving, finishing work. Fish are excellent "money-makers" and you can get the best education at Rinehart's.